PIn the series finale between the Chicago Cubs and the Colorado Rockies, John Lester would take on Tyler Chatwood, a strikeout pitcher. Lester would start off the game, striking out former Cub, DJ LeMahieu but would give up an early single tomTrevor Story. He would get caught stealing and Carlos Gonzalez would ground out to Rizzo. Chatwood would retire the top three hitters for the Cubs, 1-2-3. Both pictures would make it through three innings, including Chatwood being able to strikeout the side in the bottom of the ninth, striking out the side. Lester would answer that by striking out the first two batters in the top of the fourth but would give up a two out home run to Nolan Arenado. He would make it through 7 1/3 innings before getting pulled after giving up a walk to Tony Wolters. Adam Warren would replace Lester and would close out the eighth. Justin Grimm would come into the ninth striking out Story and Cargo but just like Lester in the fourth, he’d give up a solo home run to Nolan Arenado, except he would strikeout Gerardo Parra to close the ninth. For the Rockies, former Tampa Bay Ray, Jake McGee would come into the game, for a save. Dexter Fowler would ground out but Jason Heyward would knock a double to right. With two outs, McGee would hit Anthony Rizzo, putting two man on and Kris Bryant up to the plate. Of course, everyone at Wrigleyville is thinking walk off Home Run! The first pitch sends a rocket foul to left. With a 1-2 count, pitchers count, McGee would get Bryant to go down swinging and the Rockies would take the series 2 – 1. Today, was a pitchers duel, from the starters to the bullpens. The Rockies would strikeout fourteen times, where the Cubs only nine times. Between both teams there were only eight hits. This duel in front of 41,678 only lasted two hours and thirty eight minutes. Of course not that great as a Cubs fan but a baseball enthusiasts dream game. Tomorrow the Cubs head to St Louis for a three game series, for the season opener of one of the top three biggest rivalries in the MLB. 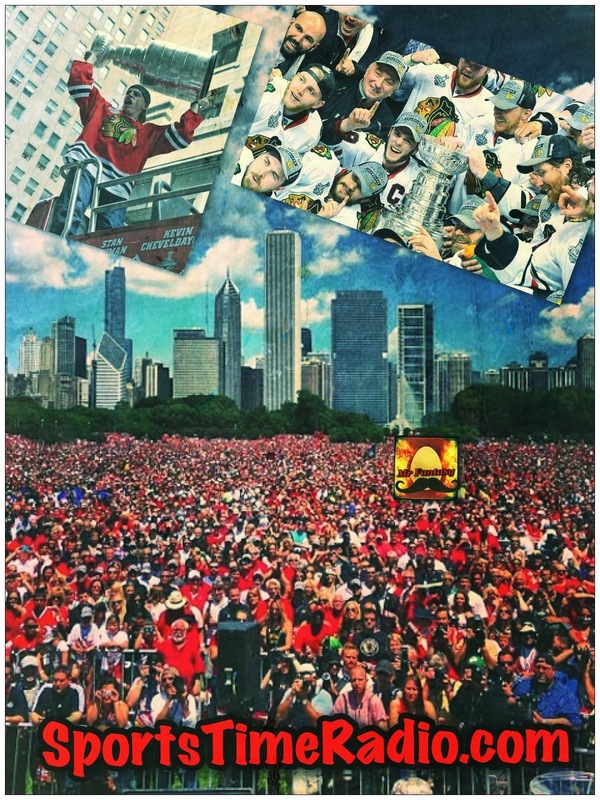 So the NHL season came to an end this week with the Chicago Blackhawks winning the Stanley Cup beating the Boston Bruins in Game 6, 3 – 2. It was one of the best comebacks I’ve ever seen in any type of sporting event. The Blackhawks scored two (2) goals very late in the 3rd period to win the game and the Stanley Cup. If you’re a regular listener to Sports Time Radio you know that Dan the Man and I both picked the Blackhawks to win the Stanley Cup at the start of the season. Maybe it was a little bit of a homer pick, but it worked in our favor. They had the parade in Chicago yesterday and there have been reports that over 2 million people attended. This of course was covered by the Chicago media from every angle. The question Dan the Man and I had last night was there was full coverage on the radio. So, my question to you would be, is this good radio? We have two (2) fantasy baseball leagues that Mr. Fantasy, Dan the Man and I play against each other in. We did a regular snake draft style league and then for the first time we did an auction draft. Our leagues differ from most though. We have 20 teams in our leagues and the outfield is position specific. One of the players in our regular league sent out a message saying he was looking for a centerfielder. I just happen to have three (3) players who qualify as centerfielders, so I thought maybe we could make a trade. I sent him an e-mail and asked him to make me an offer. His reply was that he’s not good at making offers and in return wanted me to come up with a trade. I sent him a two (2) for two (2) trade offer which he turned down, so I countered with a regular one (1) for one (1) trade. He rejected this trade offer as well and I’m running out of ideas for trades. The NBA had their draft this week as well and with the #1 pick, the Cleveland Cavaliers selected Anthony Bennett a forward from UNLV. This was a bit of a surprise pick as most experts had the Cavaliers taking Kentucky center Nerlens Noel. There was also some late talk about Maryland center Alex Len. In the end the Cavaliers selected Bennett as both Noel and Len slide down in the 1st round. As with any draft you never really know what you’re getting at the start, but most experts have been calling this a weak draft. We should start to find out about these draft picks as summer league will be starting very soon. 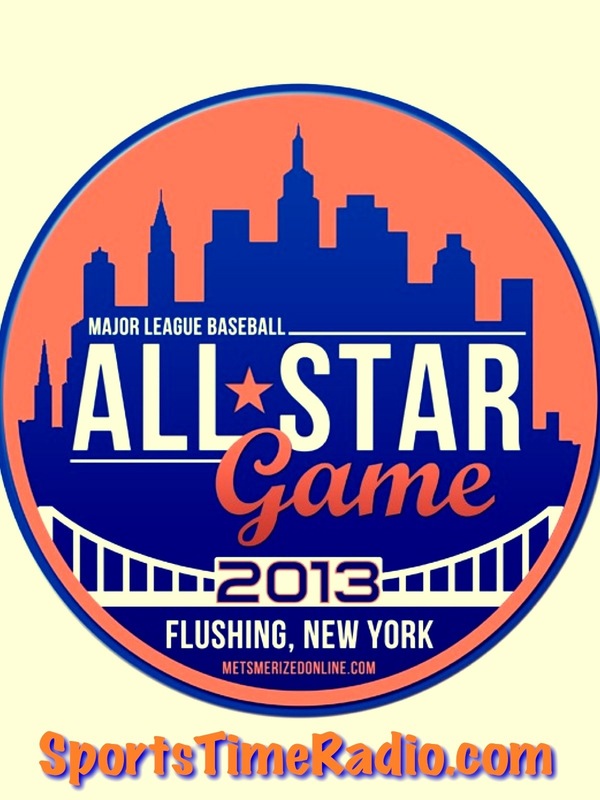 We tried something for picking the baseball all-star teams with Sports Time Radio. I actually have it totaled up and I’ll be posting it for you very soon. The NHL has only played one (1) Stanley Cup finals game. Game 2 is actually tonight; so I’m a little ahead of the game right now. The NBA Finals just played game 4. 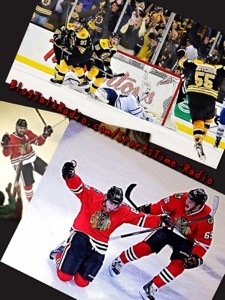 For what it’s worth the one Stanley Cup three overtime Chicago Blackhawks victory over the Boston Bruins has been more exciting than the NBA Finals four games. I understand I am way in the minority here but which of any of the NBA Finals games has come close to game one of the Stanley Cup finals. Now from here on out you never know which series will go which way but I’m saying right now it’s the NHL for me. We had Jerry Hoover on Sunday night at halftime of the NBA Finals game to break down the game. I hadn’t seen a lot of the 1st half of the game, but he described the game so well it didn’t matter that I hadn’t been able to catch a lot of the game. The San Antonio Spurs and the Miami Heat are tied at 2 – 2 in the series right now. The Tony Parker injury is the key right now and without him I don’t think the Spurs can win this series. 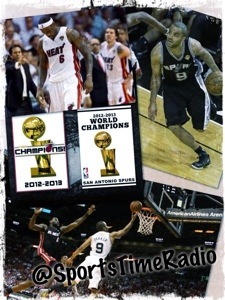 We discussed the series all week long with the big question being is this the Spurs last chance to win a title? LeBron James is far and away the best basketball player in the world and he has to show that he can carry his teammates to a title. Dwayne Wade showed up in game 4, but will Miami get anything else out of him this series. Unless Chris Bosh steps up and does something for Miami you have to look at him as a bust. Besides Parker being healthy the Spurs have to get something more out of Manu Ginobili. Game 5 is tomorrow; so will see which team can take a 3 games to 2 advantage. Major League Baseball handed down it’s suspensions from the brawl between the Los Angeles Dodgers and the Arizona Diamondbacks. Ian Kennedy got 10 games; so really 2 starts. Eric Hinske got 5 games, but I’m wondering if they got this right. In the video he doesn’t seem to be throwing any punches, but does take a shot to the back of the head from Dodgers rookie Yasiel Puig. Other players and coaches where giving 1 and 2 games suspensions and quite a few players were fined. Now the question is this over? 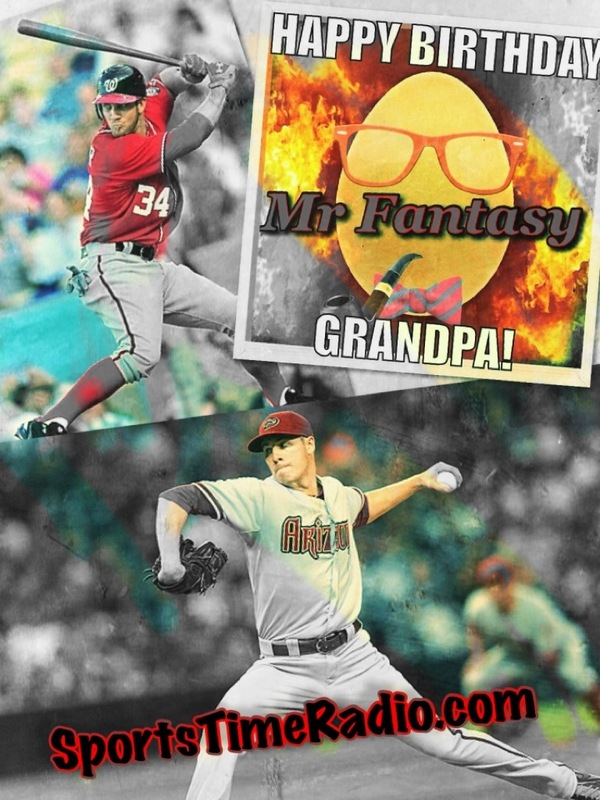 Mr. Fantasy and I have ventured into the field of daily fantasy baseball. I’ve actually managed to get ahead from my starting point, but to tell the truth I’m afraid to wager more than $1 or $2 on a game. Maybe as time goes on I’ll take more chances, but right now I’m still kind of learning the system. I was very surprised to find out how different it is than managing a weekly fantasy team; even are regular fantasy leagues where we change the line ups daily. These daily leagues are salary cap leagues; so you have to pick and choose where to spend your money. So far I’ve really enjoyed it, but like I mentioned I haven’t taken a big loss yet. It’s baseball season, so we obviously spend a lot of time talking about that on the show. Earlier in the week Mr. Fantasy and I made a trade in a money league we’re in together. We traded Washington Nationals outfielder Bryce Harper for Arizona Diamondbacks pitcher Patrick Corbin. My warning to any fantasy owner out there who has Corbin is trade him now. Mr. Fantasy and I have such bad, bad luck with pitchers that there is a chance Corbin won’t win another game this season. The really sad part about that is I’m not kidding. For whatever reason we just kill pitchers; hopefully Corbin will be our exception. Corbin is 9 – 0 in 12 starts this season. Harper has 12 home runs this season and is hitting .287, but is injured and is scheduled to see Dr. James Andrews next week to have his knee looked at. Hopefully this deal works out for us as we can use some good pitching. Friday nights broadcast: It’s Time. It’s Time. Can you believe the Boston Bruins swept the Pittsburgh Penguins out of the Eastern Conference finals. Pittsburgh had been the best team in the NHL through the first few rounds of the playoff and Boston barely got by the Toronto Maple Leafs in the first round, but here they are in the Stanley Cup finals waiting for the winner of the Chicago Blackhawks/Los Angles Kings series. The Blackhawks have a 3 games to 1 lead in the series and can close it out tonight at home. Tuukka Rask is the hot goaltender right now; so will see if he can win the Stanley Cup for the Bruins. Rask stopped all but two shots in the series against the Penguins; so will see if he can continue that impressive feat in the Cup finals. The Bruins might find out who their facing tonight. Oh my! The Miami Heat lost game 1 of the NBA finals. And the world didn’t end. Well, it did if you’re a frequent viewer of ESPN like I am. Sadly it was all they talked about yesterday and it’s weird how they never want to admit that they got beat. There’s always an excuse for a Heat loss and this one was fatigue from the Indiana series. I thought maybe they lost because Chris Bosh was terrible shooting the basketball but I guess that was just me. Do you remember before Bosh signed with Miami and he was considered one of the top players in the NBA. I know he got his championship last season but I wonder if he regrets his decision to sign there. He has a chance to opt out of his contract if not after these playoffs then after next season and I think it would be smart if he took his talents out of South Beach. Miami has the extra day off before game two so they can get over their fatigue and I expect they’ll get a win in game two at home over the San Antonio Spurs. The Spurs are a veteran team and with the way Tony Parker has been playing he’ll have a lot to say about how this series plays out. I wonder how ESPN would react if the Spurs actually win this series. 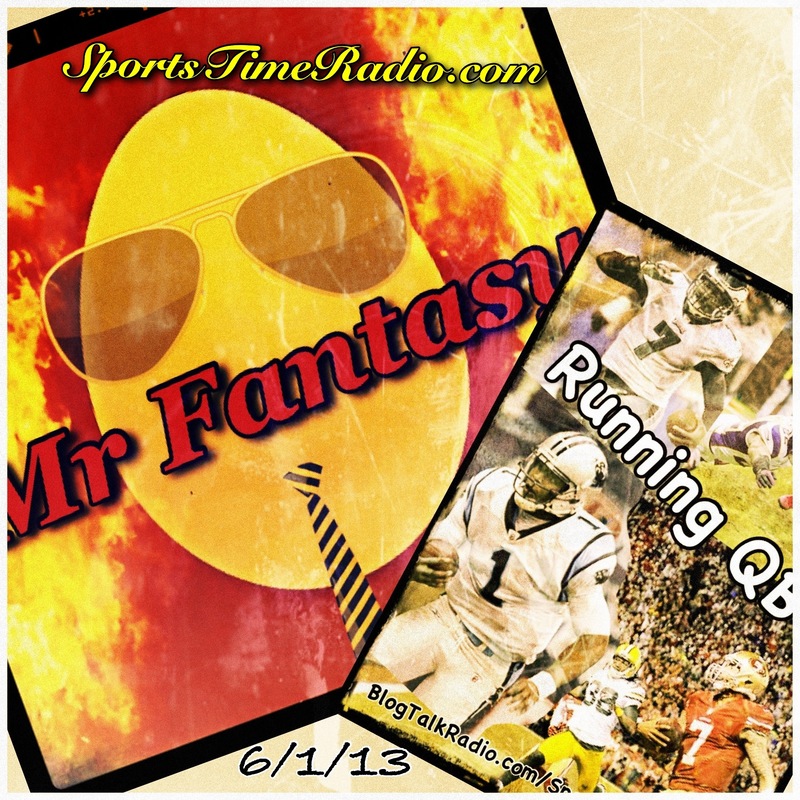 Here’s a special Sports Time Radio happy birthday to Mr. Fantasy. As always there’s a lot of stuff to get into this week, but at Sports Time Radio we had a big announcement on Sunday. Dan the Man wasn’t sure if he would be available to make the show; so Mr. Fantasy stepped in. As it turned out, Dan the Man showed and we did a three person show. We got into some football talk and between 8:40 p.m. and 8:45 p.m. Mr. Fantasy finally said he’d write the running quarterback blog. This has been a topic on the show since the end of the football season when Mr. Fantasy started talking about how much he dislikes this style of offense. 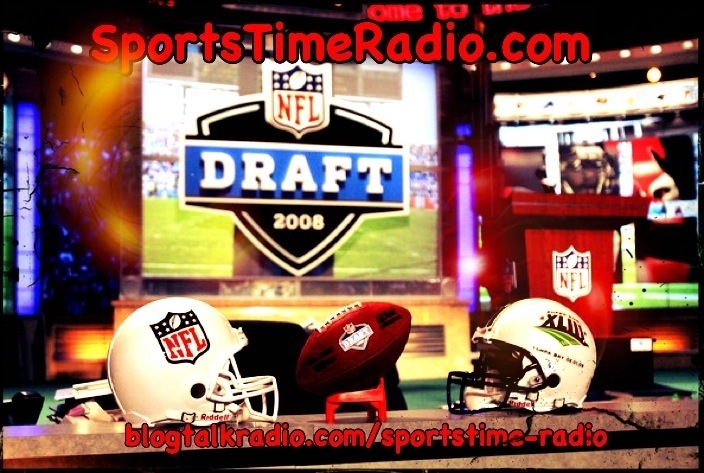 You can go into the Sports Time Radio archives and listen to it; so now we have it and will see how long it takes us to get this blog. While the San Antonio Spurs are at home waiting. The Miami Heat need one more win to close out the Indiana Pacers. Chris “Birdman” Andersen got himself suspended for game 6 because of the cheap shot he took in-game 5. Oddly if you look at the stats the Heat are a better offensive team without Andersen. Of course he’s not there to score and he brings those extra things a championship team needs. Miami has a chance to close out the series in Indiana tonight (Saturday). You have to wonder if the long lay off for the Spurs will hurt them. They are a veteran team and the rest might actually help them. Tony Parker has had a calf issue and the time off will do him good. 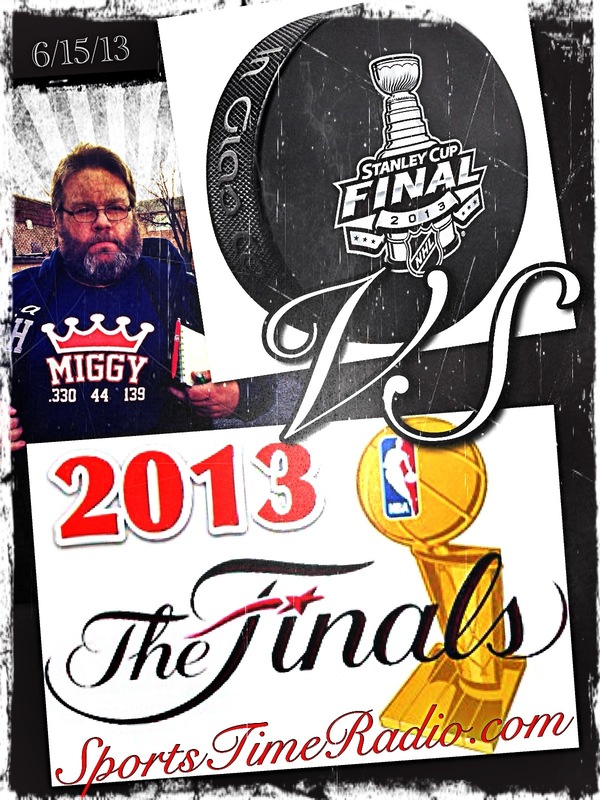 Game 1 of the finals is June 6th; so we’re getting close to crowning a NBA champion. In an odd NHL fact the four teams remaining in the playoffs the Chicago Blackhawks, the Boston Bruins, the Pittsburgh Penguins and the Los Angels Kings are the last four Stanley Cup champions. Dan the Man and I both picked the Blackhawks to win the cup at the start of the year; so he and I still have a shot at being right. On a side note Mr. Fantasy picked the St. Louis Blues. The Blackhawks are coming off an exciting game 7 win over the Detroit Red Wings. The Kings are the defending Stanley Cup champions; so will see if they can get back to the finals. The Penguins have looked like the best team in the NHL through the playoffs. We’ll see if they can continue that against the Bruins. I think the NHL playoffs may be the most exciting of all the sports. What’s better than sudden death overtime? I’ve actually mentioned this on the show a couple of times through the week, whether it was Wednesday or Friday; I think it’s worth mentioning again. If you had Dioner Navarro in your line up on May 29th you are the greatest fantasy baseball alive. Navarro went 3 for 3 with 6 RBI’s, he also scored 4 runs as well. I would be interested to know how many players in a daily fantasy league took a chance on Navarro; it would’ve paid off in a big, big way. I know later in that same baseball day Washington Nationals 3rd baseman Ryan Zimmerman also hit 3 homers in a game. I gave a special mention to Dioner Navarro because he’s a back up catcher on an under .500 team and he’s not an everyday player. It’s one of those times in the year where playoff series run over the top of each other. 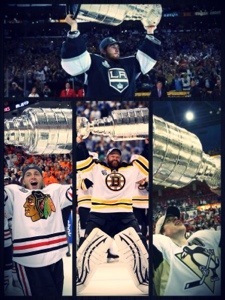 It seems like the NBA playoffs get all the attention, but for me the NHL playoffs are far more exciting. Sadly for Dan the Man and I, our pick for the Stanley Cup (The Chicago Blackhawks) are one game away from being knocked out of the playoffs. In most series the better team will win, but with the NHL I believe there are more upsets by the lower seeded teams. Remember the Los Angels Kings won it all last season as an 8th seed. The Kings still have a chance to repeat this year as they’re ahead in their series 3 – 2 against San Jose. With the strike shortened season, we didn’t get to see a lot of the Eastern Conference teams. Catching up through the playoffs; the Pittsburgh Penguins really look like the best team in the NHL. Pittsburgh closed out the Ottawa Senators last night to move into the conference finals. They’ll take on the Boston Bruins or the New York Rangers. Boston, Detroit and Los Angels have a chance to close out their series and move on to the conference finals. Oddly I talked last night on the show that if the Indiana Pacers won last night it would be a close game. 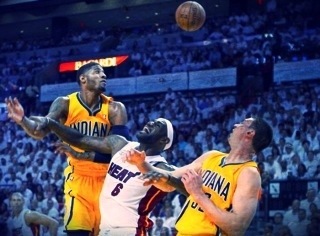 Well the Pacers won 97 – 94 and LeBron James committed two turnovers in the final five seconds to help Indian win. Looking at this series so far Indiana could really be up 2 – 0 going to Indiana. 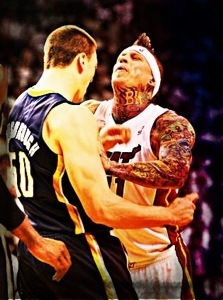 The Pacers have the pieces that the Miami heat don’t do well against. Of course when you have LeBron James on your team you are the favorite in every game. James is far and away the best player in the NBA and that can be tough for me to write; since I’m a big Kevin Durant fan. The series is headed to Indiana 1 – 1 and they say the series hasn’t started until the home team loses a game. In the Western conference San Antonio is up 2 – 0 on Memphis, but a lot of people are still picking Memphis. Jerry Hoover was on with us Wednesday night and has Memphis in this series. The series is in Memphis for the next two games; San Antonio is a veteran team and they’ve been here before; so we’ll see how the Grizzlies do at home. The baseball season is rolling along and of course the talk of the show is The Bet. At the start of the year Dan the man and Mr. Fantasy put a fitted hat on the line. Dan the Man had the Dodgers to win it all, but Mr. Fantasy said they’d be the third best team in California. Right now Mr. Fantasy is looking good, but remember #ItsJustMay. The Dodgers are sitting at 19 wins while San Diego and the Angels have 21. The Giants and the A’s each have 26 wins. 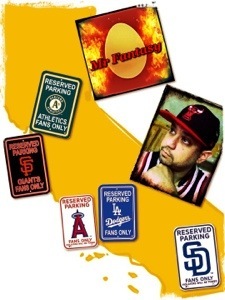 So the Dodgers have about 7 plus games to make up; so will see how things work out for Dan the Man. It seems to be a Friday night special on the show that we get an update on The Bet. So Brian Urlacher decided to retire as a Chicago Bear. As much as it seemed like he wanted to try to play this upcoming season there was no team out their willing to sign him. 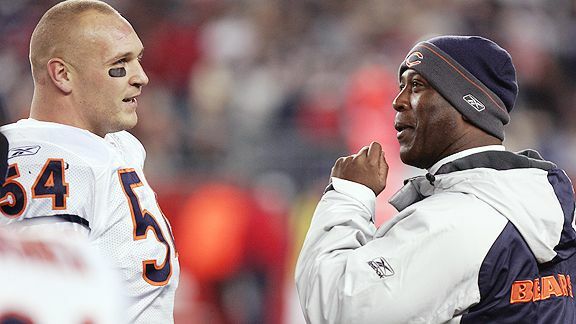 I still believe that if former Bears head coach Lovie Smith would’ve gotten one of the opening coaching positions this off-season Urlacher would be playing for that team. As we know Smith is going to be an analyst; so no one signed Urlachler. There’s no doubt the Urlacher will go into the Hall of Fame, but is he a first ballot hall of famer. On Friday nights show there was a good point brought up. Will they put two middle linebackers in the Hall of Fame in the same year? As good of a player as Urlacher was Ray Lewis was better and he retired at the end of last season as well. 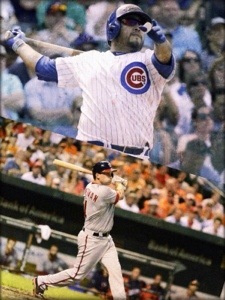 I think everyone expects that they’ll both be in the Hall of Fame, but will they go in together is the question? 2008 NFL Draft looking back. I’m sure you’ve heard your favorite teams coach or general manager say it takes five years to actually evaluate the draft they just had. Since the 2013 NFL draft just ended I thought let’s go back, check and see how the players turned out. You’ll be the one to decide how your teams 1st round pick turned out. #1 Miami Dolphins took Jake Long. Long signed with the St. Louis Rams as a free agent this off-season. While with the Dolphins he started 74 out of the 74 games he played their. He was limited to 12 games last season because of injuries. Long made 4 pro bowls in his five seasons in Miami. #2 St. Louis Rams took Chris Long.Long has 42 career sacks for the Rams, but has come on in the last two seasons going over double digits in sack totals. Long has played in all 80 games since being drafted starting 68 of them. Also Jake and Chris went #1 and #2, but they’re nor related. #3 Atlanta Falcons took Matt Ryan. Atlanta was looking for a franchise quarterback in this draft and they seemed to have found one. Ryan has started 78 out of a possible 80 games since being drafted. He missed two games to injury in his second season. Ryan has thrown for 18,957 yards and 127 touchdowns. #4 Oakland Raiders took Darren McFadden. McFadden has been injury a lot playing in a total of 57 games. McFadden started 44 of those games. He’s rushed for 3,334 yards and 18 touchdowns in his career. He’s has also added 158 catches and 5 touchdowns in his career. #5 Kansas City Chiefs took Glen Dorsey. Dorsey signed with the San Francisco 49ers this off-season as a free agent. Dorsey played in 66 games for the Chiefs starting all but 1 of them in five years. He only played in 4 games last season due to injuries. He has career totals of 159 tackles and 4 sacks. #6 New York Jets took Vernon Gholston. Gholston was with the Jets for three season. He played in 45 games for them; starting 5 games, but never recording a sack. #7 New Orleans Saints took Sedrick Ellis. Ellis has played in 70 games for the Saints starting all of the games he’s played in. He has 100 career tackles and 12.5 sacks. #8 Jacksonville Jaguars took Derrick Harvey. Harvey player 3 seasons in Jacksonville and 1 in Denver. 8 career sacks, 72 career tackles and 1 interception are the numbers he put up..
#9 Cincinnati took Keith Rivers. Rivers was in Cincinnati for 4 seasons and was with the New York Giants in 2012. Rivers has been in 46 games registering 149 tackles, 2 sacks and 2 interceptions in his career. #10 New England Patriots took Jerrod Mayo. Mayo was the AP defensive Rookie of the Year for 2008 and has made 2 Pro Bowls (2010, 2012). He’s played in 75 games starting 73 of them. He has 225 tackles, 7.5 sacks and 3 interceptions in his career. #11 Buffalo Bills took Leodis McKelvin. McKelvin has played in 64 games starting 32 of them. He has 6 career interceptions and has 1 returned for a touchdown. He also has been used as a kick and punt returner. He has returned 3 punts for touchdowns and has 1 kickoff return for a touchdown in his career. #12 Denver Broncos took Ryan Clady. Clady is a three-time pro bowler, 2009, 2011 and 2012. He has played in and started all 80 games since being drafted by Denver. He has also been named to an All Pro team every year he has played. #13 Carolina Panthers took Jonathan Stewart. Stewart has shared carries in the Panthers backfield since being drafted, but did break the 1000 yard barrier in 2009 with 1133 yards. He has 3836 career rushing yards and 27 touchdowns. He has also caught 98 passes in his career with 4 of them going for touchdowns. #14 Chicago Bears took Chris Williams. Williams started 38 games for the Bears in the time he was with them. He was released last season and finished the year with the Rams, but was just a back up for them. #15 Kansas City Chiefs took Branden Albert. Albert played in 73 games for the Chiefs in his career and started 71 of them. He was their franchise player this off-season and the Chiefs have been trying to trade him. #16 Arizona Cardinals took Dominique Rodgers – Cromartie. Rodgers – Cromartie played 3 seasons in Arizona before going to Philadelphia for the last two. He had 13 interceptions while in Arizona and 4 of them were returned for touchdowns. He’s added 3 more interceptions with Philadelphia and 1 sack as well. #17 Detroit Lions took Gosder Cherilus. Cherilus has played in 75 games for the Lions starting 70 of those games. #18 Baltimore Ravens took Joe Flacco. The Ravens where looking for their quarterback of the future in this draft and they picked Flacco. Seems to have worked out well for them. Flacco has started all 80 games since being drafted. He’s put up 17,633 yards and 102 touchdowns in his career. The Ravens won the Super Bowl last season and Flacco was the M.V.P. #19 Carolina Panthers took Jeff Otah. Otah started 25 games combined for the Panthers in 2008 and 2009 before missing the 2010 season. He came back to start 4 games in the 2011 season, but that was it. #20 Tampa bay Buccaneers took Aqib Talib. Talib played 4 plus seasons with the Buccaneers before being traded to the Patriots last year. He had 18 interceptions for Tampa Bay while playing for them and took 3 of them back for touchdowns. Talib had some off field issues and has been suspended for them. #21 Atlanta Falcons took Sam Baker. After picking Matt Ryan earlier in the draft the Falcons wanted someone to help protect him. Baker played in 65 games for the Falcons starting 56 of them. He started 15 games for them last season. #22 Dallas Cowboys took Felix Jones. Jones has had some injury issues in his pro career, but he broke out as a kick returner his rookie season. He’s played in 64 out of a possible 80 games; starting 23 of them. He has a total of 2728 yards rushing for his career with 11 touchdowns. He has returned 1 kickoff for a touchdown; in his rookie season. #23 Pittsburgh Steelers took Rashard Mendenhall. Mendenhall was the second of three running backs to go in a row and he’s another one that has had some injury problems. He’s played in 57 games starting 48 of them. He has also broken the 1000 marker twice in his career. He has totaled 3549 rushing yards and 29 touchdowns for his career. Due to injuries Mendenhall was only able to play in 6 games last season. #24 Tennessee Titans took Chris Johnson. Johnson has topped a 1000 yards every year since being drafted and in 2009 went over the 2000 yard mark by 6 yards. He’s only missed 1 game in his career and has made 77 starts for the Titans. He has rushed for 6888 yards and 44 touchdowns in his career. He has carried the ball 1463 times and averages 4.7 yards a carry for his career. #25 Dallas Cowboys took Mike Jenkins. Jenkins has played in 71 games since being drafted and has started 48 of them. He has 8 career interceptions and has 1 interception return for a touchdown. Jenkins was also made the Pro Bowl in 2009. #26 Houston Texans took Duane Brown. Brown has played in 75 games in his career and has started every one of them. He missed 4 games in 2010 with an injury and 1 game last season. Brown was a pro bowler for the 2012 season and a 1st team all pro. #27 San Diego Chargers took Antoine Cason. Cason has played in all 80 games since being drafted and has started 49 of those games. He has 12 career interceptions and 1 interception return for a touchdown. Cason has also returned punts for the Chargers; mostly in the 2010 season. #28 Seattle Seahawks took Lawrence Jackson. Jackson only played two seasons with the Seahawks. He played in 32 games and started 24 of them. He also totaled 6.5 sacks while in a Seahawks uniform. Jackson has played the last three seasons with the Detroit Lions. #29 San Francisco 49ers took Kentwan Balmer. Balmer played in 27 games for the 49ers. He didn’t start any of them. He recorded 11 tackles in 2 seasons, but no sacks. In 2010 he played for Seattle and the last two seasons he has been with the Washington Redskins. #30 New York Jets took Dustin Keller. Keller has played in 72 games for the Jets starting 49 of them. He has 241 career receptions for 2876 yards and 17 touchdowns. Keller was injured for a lot of the 2012 season playing in 8 games and starting 5. Signed with the Miami Dolphins this off-season. #31 New York Giants took Kenny Phillips. This was the last pick of the 1st round. New England had their pick taken away as a penalty for the Spygate mess. Phillips has had some injury issues in his career. He has played in 56 games for the Giants starting 41 of them. He only played in 2 games in 2009 because of injuries and last season he appeared in 7 games. He has 8 career interceptions with 4 of them being picked off in 2011. There’s the 2008 1st round. How did your team do? Good, bad or just middle of the road with their guys. Feel free to let me know; you can comment right here or e-mail our show Sportstimeradio@hotmail.com or just find me on Twitter @burketime.